Chard is a beet that has been chosen for leaf production at the expense of storage root formation. Chard will produce fresh white, yellow or red leaf stalks. It is an attractive ornamental that adds color to the vegetable garden. Chard goes by many names—Swiss chard, leaf beet, seakettle beet, and spinach beet to name a few. It is a beautiful large-leaf vegetable with wide flat stems resembling celery. The ruby variety is especially charming with its' vivid red stem with broad dark green leaves. If you like spinach, you will adore chard. The flavor is mild yet earthy and sweet with slightly bitter undertones. The word "Swiss" was used to distinguish chard from French charde or chardon by nineteenth century seed catalogues publishers and the name stuck. Chard is very popular among Mediterranean cooks but the first varieties have been traced back to Sicily. In the US the leaves are valued while European cooks value the stalks to the point of discarding the leaves or feeding them to animals. Swiss chard is a cool-season vegetable that prefers sunny locations and fertile, well-drained soil. Swiss chard tastes best when plants grow rapidly and mature before the heat of summer. Irrigation should be frequent to ensure good growth. Swiss chard comes in a variety of leaf colors. Planting a range of different types makes salads and meals more interesting. Soil Preparation: Before planting, incorporate 2-4 inches of well-composted organic matter or apply 4-6 cups of all-purpose fertilizer (16-16-8 or 10-10-10) per 100 square feet. Work this into the top 6 inches of soil. Swiss chard can be sown after soils reach 40°F. Seeds germinate best at 55-75°F and require 7-14 days to emerge. Temperatures above 80°F reduce seed germination. Seeds should be planted ½-1 inch deep. Thin stands when plants have 3-4 true leaves. Planting and Spacing: Seeded or transplanted Swiss chard should be spaced 6 inches between plants in the row with rows 12 inches apart. Swiss chard grows best when temperatures do not exceed 75°F. Temperatures down to 32°F do not seriously damage young plants. Transplants should be planted near the last frost-free date for the growing area. 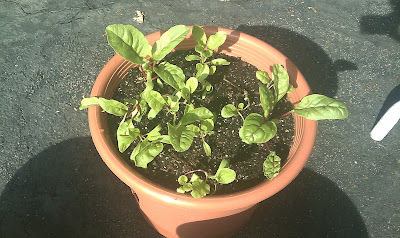 Seeded Swiss chard may be planted 3-4 weeks earlier. High summer temperatures reduce growth, decrease quality, and may cause bitter or off-flavors to develop. For fall Swiss chard, select early maturing cultivars and plant 50-75 days before the anticipated maturity date. The maturity date should be about 2-3 weeks before the first fall frost. Plants can be left in the garden after light frosts. Water: Water chard regularly supplying 1-2 inches per week. Fertilization: Apply 1/4 cup per 10 foot of row of a nitrogen-based fertilizer (21-0-0) 4 weeks after transplanting or thinning to encourage rapid plant growth. Place the fertilizer to the side of the plants and irrigate it into the soil. When is the best time to plant Swiss chard? Swiss chard should be planted 2-3 weeks before the anticipated last frost in the spring. Plant 3-4 weeks before the anticipated first frost in the fall for an autumn crop.